Oregano is most likely a staple of your spice rack, and evidence shows that this fragrant herb's essential oil should be part of your medicine cabinet. Oregano -- specifically wild oregano native to the Mediterranean region, (Origanum vulgare) -- is loaded with antioxidants and other potent compounds that have a variety of health benefits. Here are five reasons to use oregano in the kitchen and add an oregano supplement to your wellness regimen. 1. It supports heart health. In one study, 48 people with mildly high cholesterol were given diet and lifestyle advice to reduce their cholesterol. Thirty-two of those people were also given oregano oil after each meal. After three months, those given the oregano oil had lower LDL (bad) cholesterol and higher HDL (good) cholesterol compared to participants who just followed the diet and lifestyle advice. 2. Oregano is extremely high in antioxidants. Wild oregano is high in phenols, plant chemicals with antioxidant activity. Second only to clove oil, wild oregano oil has the highest known ORAC value, which measures the total antioxidant capacity of a food. Gram for gram, oregano has 42 times the antioxidant level of apples and four times that of blueberries. Antioxidants combat free radicals, which play a role in aging and the development of cancer, cardiovascular disease, and other illnesses. 3. Oregano has antifungal properties. Yeast is a type of fungus, and Candida is the most well-known yeast and a common cause of infections. High levels of Candida are not only linked to yeast infections but also gut conditions like ulcerative colitis and Crohn's disease. 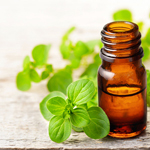 Test-tube studies find oregano oil to be effective against several different types of Candida. 4. It's a natural antibiotic. Oregano, particularly the carvacrol it contains, is effective for fighting bacteria, and it is especially promising for preventing illnesses caused by pathogens like Salmonella, E. coli, and Staphylococcus aureus. Research also shows that oregano oil may be effective against certain types of bacteria that can become resistant to antibiotics. 5. It's helpful during cold and flu season. If you're congested, try adding a couple drops of oregano oil to a diffuser or vaporizer. The steam method can also help relieve coughs and other respiratory illnesses. Drinking a few drops of oregano oil in juice or water may soothe a sore throat. Look for pure, high-quality Origanum vulgare as bottled liquid oil and in capsules at your natural market.